What image comes to mind when you think of apples of gold in a setting of silver? Do you envision a masterful centerpiece welcoming all guests to the table of delightful fellowship with a delicious meal and heart warming conversation? 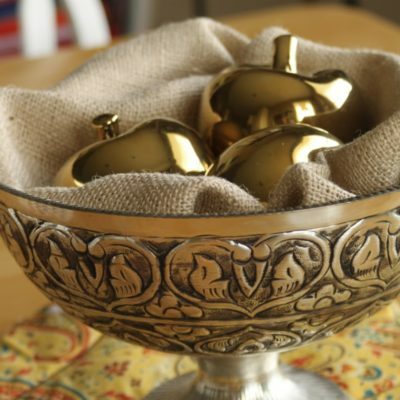 Or do you think of a silver bowl filled with golden apples inviting all who come into its presence to enjoy its beauty and rest for a while in the tranquility of the peaceful beauty it presents? But the focus of this verse is not the apples surrounded by the silver. No, this great beauty and richness is like unto something else. What could compare to such imagined beauty? But more than words. Words fitly spoken. But what are such words? Cards are such “Apples of Gold”. We choose the words or the card that seem to us to fit the circumstance of the one to whom we are sending. We hope the words and the card itself will bring peace, joy, comfort or whatever is needed to the one who is on our mind and in our heart. Thank you, ladies especially, for the abundance of cards sent by you.